Best Nail Art is here to share with you 18 Trending Nail Designs That You Will Love! You may not love every single nail image here but you certainly will love the majority of these pretty nails. We made sure to pick what is trending right now and what will be trending for a long time so you can get inspired to paint your own nails in a similar fashion. Keeping your nail on point all year round is a must if you are nail enthusiasts like ourselves. 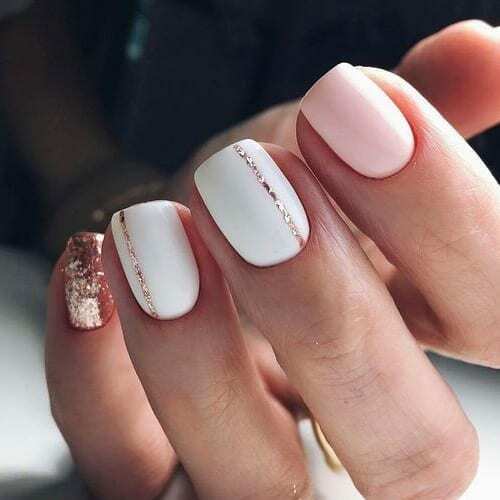 Please enjoy the 18 Trending Nail Designs That You Will Love! Any time someone uses glitter on their nails as a choice for their manicure is a plus. The two nails that feature glitter along with the flat painted grey nails in the middle make for one amazing nail experience. French tips are always the go-to choice for a pretty manicure. However, these french nails offer a brand new experience to the viewer. Here you will see the thin white strip commonly featured in a french tip but a bit lower. Then, on top of all that, you will see sparkly, silver glitter to make a unique french manicure. The neutral color of this polish really makes my day. There is also a slight ombre thing going on here on a couple of these nails if you look closely. The copper glitter on the acrylic nails is a nice touch too. Now this is what we are talking about! This nail image above really shows off a trending style that you can do from your own home. The solid blue color along with the stripes over the white lacquer is totally a DIY project. Try it yourself! These nails are fierce! The solid black acrylic nails along with the sparkly, glitter nails make for a great contrast. We are also big fans of the shape of these nails. This is the perfect pick for a luxurious fashion night. This is such a pretty manicure! The soft orange color is very delightful and I can’t imagine seeing anything more calming and pretty than these nails. You will notice a bunch of glitter as almost a theme here and this is another great example of that. Wow! These nails are so pretty! You have so many colors going on here like copper glitter, white and a soft pink. The way this nail artist contrasted all of these elements is breathtaking. We keep getting blown away by all of these images of nails and it never ceases to amaze us. The soft neutral color of this polish along with the accent pieces and gold glitter works perfectly all suited together. Next time you get acrylic nails you should definitely go with a design like the one above. This is as professional as it gets! The nails are on point and the colors are perfection. It looks like this artist used Laura G by Liveglame for the soft, more neutral shade but we are not sure what polish was used for the rest. Either was, this is amazing and we are so happy this exists! You ever look at something and it holds you back for a moment? This is what caused it for us! The length of these acrylic nails are just fabulous. I’m not sure how you even function on the daily without staring at your own nails all day. These are the perfect summer nails and the pineapple and tie dye print is a great touch. Every other nail features a different color which works for great contrast. The lavender with the neutral tan color work so pretty together. Glue on some cute accent pieces and you will be set. The designs in this manicure are seriously perfect. Look at how perfect the lines and shapes are with this particular style. Aside from the perfection aesthetic, the colors of pink, white and gold glitter look amazing together. Whoa! This looks like a giant slab of marble. The lavender, purplish color along with the purple glitter is really making this special. However, the nails that look like a marble dining table is what really caught our eye. This is as perfect as it gets! Blown away! It’s like you dipped your nails in a blizzard of heavy snow! The white color is very vibrant especially contrasting this girl’s skin tone to perfection. I love the solid white color on the acrylic but I really enjoy the powdery white and the speckle effect on the outer nail. Soft shades are the best shade IMO. Then, every other nail you have a glitter feature which makes it a wonderful contrast. The first glitter nail is a cover all nail and the outside glitter nail is mostly just the top of the nail. Beautiful and very creative! Is it New Year’s Eve? These nails remind us of a New Year’s Eve party because these are the colors to bring in the new year. With the black and gold glitter, you are set to dazzle up any party you attend this year. Here is another manicure that we believe can be done at your home. Look at how smooth the neutral nail polish looks on the acrylic nails. Then you add some gold sparkles right on the bottom of the nails and you can do this too. Ombre, Ombre & Ombre! The bottom is a neutral, almost soft pink shade of polish and it transcends into a perfect white tip. Not only is this an ombre styling, it also is basically a futuristic french tip. The length and the style makes these nails so pretty. Breathtaking!